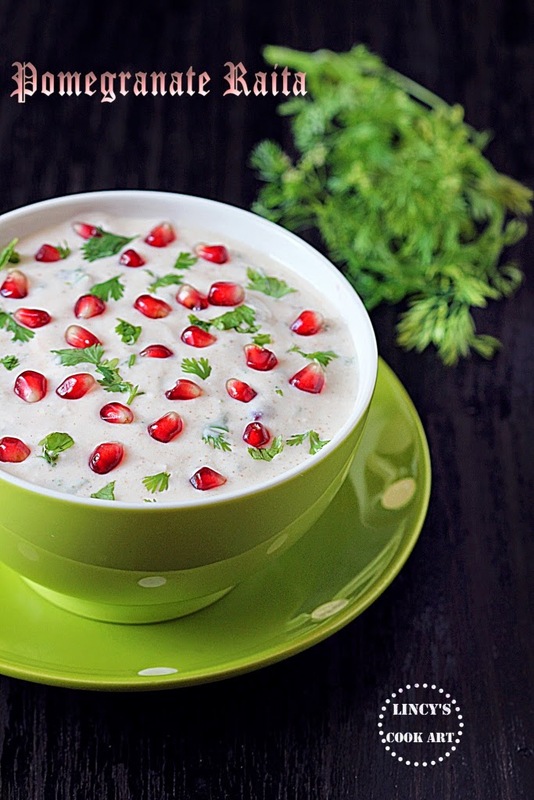 Pomegranate Raita: Raitas are yogurt based salads which involve no cooking. Some times the veggies are only cooked and mixed in yogurt. Easy, simple and tasty raitas which could be consumed with rotis as well as variety rice such as any types of pulao or biryanis. Goes well with any chaat items with a teaspoon of added sugar. A colourful and healthy dish as it is sour by nature & when consumed with the fruit is as such sweeter. The sweet and tangy crunchy seeds of the pomegranate with the creamy yogurt gives nice texture as well as taste to this colourful raita. Beat the yogurt well with out lumps. Add 1/4 cup of water or starch water drained from rice if required to dilute the curd. Add the pomegranate seeds, chilli powder, roasted jeera powder, some chopped coriander leaves and some salt. Mix with a spoon and serve chilled with some pomegranate seeds on top. You could add some cooked sweet corn or peas too with this raita. I just loved this....looks so inviting.......Superb pic..